In mid-November, 36 boys and girls between the ages of six and ten had the chance to learn to play hockey for the first time. A group of kids had the opportunity to learn how to play hockey through the First Shift program for six weeks in November and December. They received all necessary gear and lessons from volunteer coaches. In mid-November, 36 boys and girls between the ages of six and ten had the chance to learn to play hockey for the first time at no cost to their families. 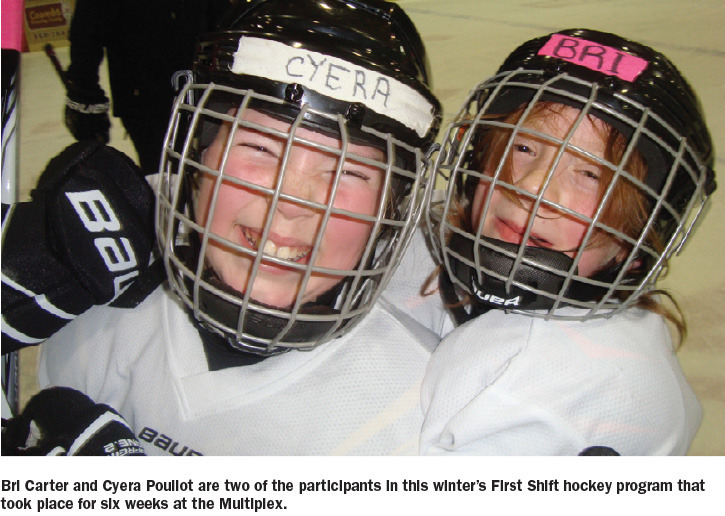 The First Shift, a six-week program partnered with Bauer, Hockey Canada and the Alberni Valley Minor Hockey Association, is aimed at helping kids who have never tried the sport, to receive free gear and coaching. Angela and Mike Cole were involved in both the coordination and coaching aspects and their two girls participated. “Last year (AVMHA) applied for it and this year I was new to town so I took it on as administrator and am happy that it was such a huge success,” Cole said. On the first day, the participants received gear to outfit themselves from head to toe. They rotated to various stations at the multiplex to be fitted with a helmet, stick, gloves and skates. Seven representatives were there from Ontario and the program attracted ten volunteer coaches, who also received equipment. “There was one coach for every three players,” said Al McCulloch, AVMHA president. Cole’s husband, Mike, was one of the volunteers and said he was reminded of why he loves to coach kids. “When you are teaching kids who are just starting out, you can see them develop so fast and the rewards are immediate,” he said. The coaches started with the basics and by the last day, many were ready to sign up for more. “Because they are so young, the learning curve is huge,” Angela said. Most will have to wait until next season, but Cole said she will fit them in with a pro-rated fee if there is space. “We will for sure get them on the ice,” she said. Cole said her personal goal is to not only integrate these kids into minor hockey and onto teams, but establish an all-girls team with the teenagers who are playing now. McCulloch said First Shift could be a boost to player numbers in the local minor hockey system. “If they all sign up, we could have an increase of 10 per cent,” he said. Cole has applied to bring the program back to Port Alberni.